Grant’s Tomb is located near Riverside Church at 122nd and Riverside Ave. After Grant died in 1885, there were several possibilities for a burial site: St. Louis where Grant had lived before the Civil War, Galena, Illinois, which was Grant’s home from before the Civil War until after his presidency, and New York City, where Grant lived in his last four years. Before he died, Grant ruled out West Point because his wife Julia could not be buried beside him. The Grant family chose Riverside Park after ruling out Central Park. Grant’s funeral attracted 60,000 marchers that stretched seven miles and took five hours to pass. Over one million spectators witnessed the parade. Attendees included President Grover Cleveland, his cabinet, justices of the Supreme Court, high level figures in the Civil War, and every member of Congress. Grant’s remains were placed in a temporary vault in Riverside Park. The day after his death the mayor of New York City wrote a letter to prominent New Yorkers for support for a National Monument in Grant’s honor. A committee was established called the Grant Monument Association (GMA) and headed by ex-President Chester A. Arthur. Early fundraising efforts were slowed by a negative public opinion expressed by out of state press questioning why local residents should help finance a monument in wealthy New York City. Some believed the monument should be in Washington D.C. and some criticized the GMA for not donating enough to support the cause. Not having a concrete plan for a memorial hurt fundraising as donations lagged financial goals by a substantial amount. Finally in 1888, the GMA announced a design competition. John Hemenway Duncan won the contest. The objective of his design was to “produce a monumental structure that should be unmistakably a tomb of military character.” The estimated cost was between $500,000 and $900,000. The interior is similar Les Invalides in Paris while the exterior is modeled after the Mausoleum of Halicarnassus. The twin sarcophagi of Grant and his wife Julia are similar to that of Napoleon at Les Invalides. A debate still raged on where to put the remains, New York or Washington, D.C. The argument ended in 1891 and ground was broken on the 70th anniversary of Grant’s birth. President Benjamin Harrison laid the cornerstone. 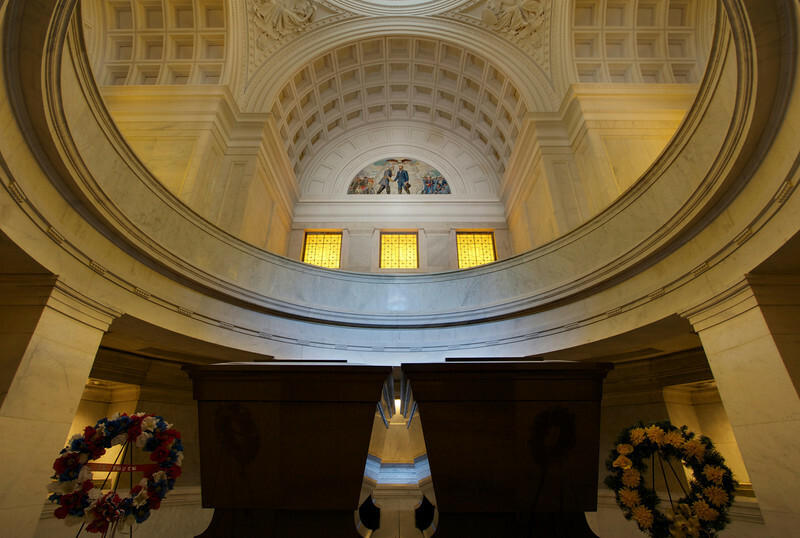 On April 27, 1897, the 75th anniversary of his birth, Grant’s Tomb was dedicated. The day was a full public holiday, Grant Day, and the number of spectators (about one million with 60,000 marchers) was as great as during Grant’s funeral twelve years earlier. President William McKinley addressed the crowd. Julia Grant died in 1902 and her remains were interred beside her husband. In the early days, Grant’s Tomb was one of the nation’s great and most popular monuments, attracting over 500,000 people annually. The sight attracted more people than the Stature of Liberty through World War I. The Works Progress Administration (WPA) restored the monument in the 1930’s. Projects included restoring the roof, installing electric lighting and heating systems, removing purple stained glass windows, and restoring of two rooms where battle flags were displayed. The WPA installed five busts in the crypt area. The tomb was rededicated in 1939. In 1958, the National Park Service (NPS) was granted authority to oversee the monument. Due to a lack of planning and maintenance, the site deteriorated. In the 1970s through the 1990s the site suffered due to vandalism and graffiti. In the early 1990s, Frank Scaturro, a student at Columbia University who volunteered at Grant's Tomb, reported the problems he observed at Grant's Tomb to his supervisors in the NPS. After unsuccessful efforts to secure improvements, he went public with a report documenting the condition of Grant’s Tomb. Two Illinois state senators proposed moving the tomb to Illinois if the NPS did not meet obligations in maintaining the site. In 1994, the U.S. House of Representatives introduced legislation to restore and preserve Grant’s Tomb. The restoration effort sanctioned by Congress was completed and the tomb rededicated in 1997. For much more detail on the history of Grant’s Tomb, see Grant's Tomb and Wikipedia. We had a family outing to Grant’s Tomb and Riverside Park on a warm Saturday in June 2012. Eagerly approaching the building, we noticed that it was closed; it has strange hours, from 10-11 am, noon-1 pm, 2-3 pm, and 4-5 pm. Waiting for the noon opening, we went to the nearby visitor center. It is a rather small, spartan building, consisting of restrooms, a souvenir shop, and small room with information and a few artifacts on Grant. To our relief, the center was well air-conditioned on a hot summer day. After watching a short video, we walked around the Tomb. There are odd-looking mosaic benches surrounding the building. The City Arts Workshop put up the benches, done by children in 1973 in an effort to beautify the site. I don’t think the benches fit well next to a tomb of a great leader and we should be thankful that no such project was contemplated around other great monuments such as the Lincoln Memorial or Washington Monument. The interior resembles Les Invalides, the final resting place of Napoleon with the dome roof and twin sarcophagi of Grant and his wife Julia. We spent a half hour touring the site along with about a dozen other people. It is fairly dark, so a tripod is nice to have and tripods are allowed. The area has other interesting sites such as Riverside Church and Saint John the Divine, and if the kids get bored, Riverside Park.